. 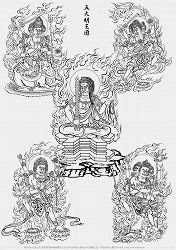 Godai 五大　Five Gread Buddhas . Copyright 1998, Nara National Museum. Nara, Japan. This grouping is common in esoteric Buddhism. Ceremonies in front of these statues were used to pray for the destruction of a personal enemy or for political intrugues, for example during the war of the Genji and the Heike, where five priests at the temple Ninna-Ji in prayed to these five statues (godan no hoo　五壇の法) to win the war. 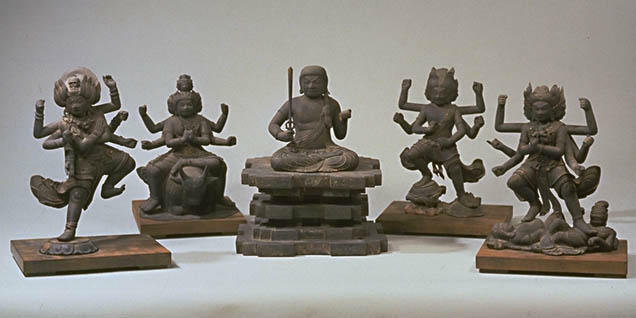 Fudo (center), Kozanze (Gozanze) (east), Gundari (south), Daiitoku (west) and Kongoyasha (north ). 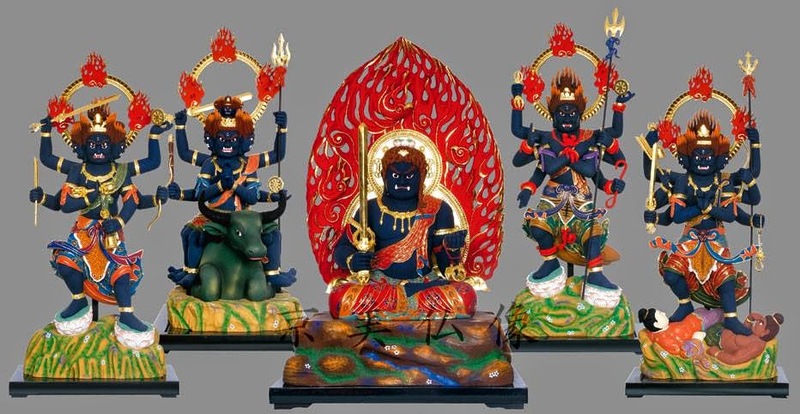 The images of Godaison are drawn as five separate paintings have been seen from the early Heian period and some examples such as Godaison-zo held at To-ji Temple in Kyoto are known. 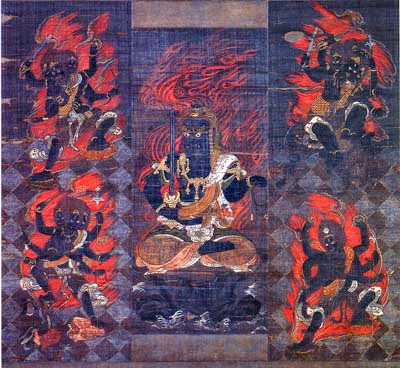 However, just like this painting, the style of Godai Myoo represented in one painting (Fudo Myoo at the center and others in each of the four directions) was established later than that and the images in Hakubyou (ink line painting) first appeared in the period between the late Heian period and the early Kamakura period. In terms of the style, Fudo has a similar but more ample body than the Ao Fudo held in Shorenin in Kyoto and the faces are similar. 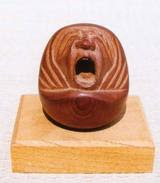 It indicates an iconography of Genchoyou (Gencho's style). 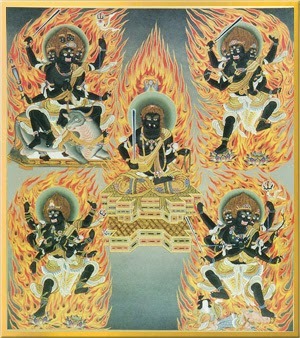 The halo with flames on the back is divided into seven parts as if they were the flames of a Karura (a fire-breathing creature from Japanese Hindu-Buddhist mythology). 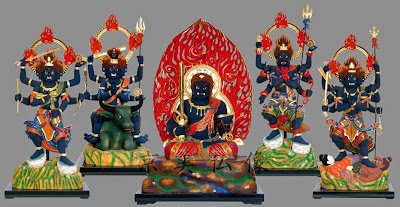 Two images of Doji have a style mixed with those held in Horaku-ji Temple in Osaka and Ruri-ji Temple (also known as Ruridera) in Hyogo. (Seitaka Doji is the same as Ni-Doji with a style of Hakubyo Genchoyou held at Godai-ji Temple.) 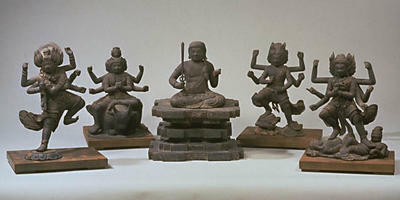 The iconographical features of other four Myoo are very similar to the four Myoo excluding Fudo among Godaison in Godai-ji Temple and is also the same as the iconography of Enjinyou contained in "Besson Zakki." In a word, this painting was drawn in a newly established style by combining multiple styles of iconographies. Unlike Ao Fudo, no colorful or fine patterns are applied to Fudo Myoo. The expressions such as the heavy colors, strongly applied Kumadori (shading) and expressive ink lines are rather different from the Buddhist paintings in the Heian period and indicate unique the features of the powerfully expressed Buddhist paintings in the Kamakura period. CLICK for more statues and paintings !
. Ookuboji　大窪寺　Okubo-Ji, Shikoku 88 .
. 弘法寺 Kobo-Ji - Kagoshima Pilgrims 48 .
on the Pilgrimage to 36 Fudo Temples in Shikoku. 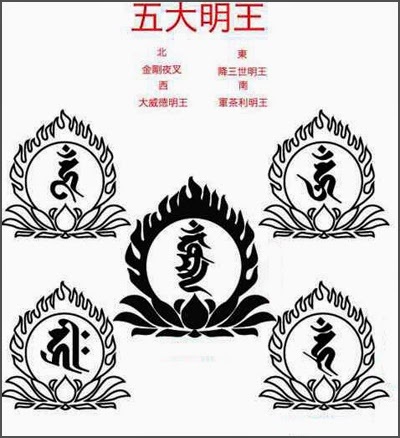 "The Venerable Five" (godai son 五大尊). 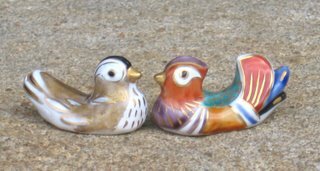 In the Tendai sect, Uzusama Myo-O 鳥枢渋摩明王 is mostly depictede in the North. This version comes from China of the T'ang period, not from India. Other scriptures state that the five great wisdom kings where established in Japan. 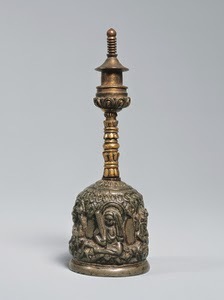 The Ritual Bell with the five great wisdom kings (godai myo-o rei 五大明王鈴) is only to be found in Japan. 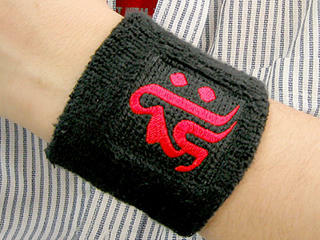 You can even buy wirst bands with the Sanskrit letters of the five great Myo-O. Godaidoo 五大堂 Godai-Do "Hall for the Great Five"
. 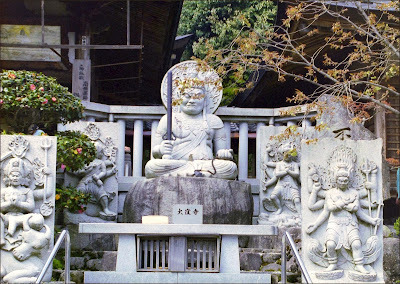 Godai-Do Matsushima 五大堂 松島 .
. Fudo Temples - Introduction .